Ideally located, Apartment with terrace at first and last floor, in a secure and wooded luxury résidence : Le Grand Large. View of the sea and cliffs. Southern exposure. Revestel the district, is located in the Golden Triangle of Cassis, quiet. You get an ideal location for access 5 minutes walk to all activities, beaches, village center, restaurants, cafes, markets, port. You can walk around during your stay for your comfort. There is a registered private parking near the apartment, a visitor parking at the entrance of the residence, if you have more than one car and access to the sea at the bottom of the residence. In the apartment, the living room bay window opens onto the terrace facing the bay of the arena of cassis. Semi equipped kitchen open to living to share good moments of conviviality. In the bedroom, whose picture window overlooks the park of the residence, you can easily find the rest. CASSIS: Cassis, a small Provencal fishing port nestled between 2 natural sites: the famous mountain range of the Calanques and the majestic Cap Canaille. Here you live in your own pace, starting the day with breakfast on the harbor cafe terraces and enjoy the nice view of the Cassis boats. Once refreshed, you can climb on a hike in the Calanques, Port Miou, Port Pin and En Vau. This is an opportunity for a relaxing break with picnic and swimming in the clear waters and take great photos because the scenery is unique in Cassis. The return to the village is magical and takes a different perspective as you explore the grandeur of Cape Canaille and fabulous sunset, the harbor and the bustling village with its restaurants, cafes and small shops. In the evening, many activities are organized by the city: theater concerts, exhibitions and events. These words of the Nobel Prize for Literature, Frederic Mistral on their own translate the tremendous attraction exerted by Cassis over all those who visit. Activities: The day of many activities await you: hiking, shopping, visit the creeks by boat windsurfing, sea kayaking, golf, climbing. For those who like to taste the wines, many wineries open their doors to visit their wonderful site and tasting. Les Calanques : The Creeks: Regarded by climbers as a must, creeks provide all kinds of walks: the quietest to the most athletic. 160 km of trails are marked. You can also discover the coves by the sea, the trip will be unforgettable! The bathroom is light and airy with a skylight opening on the roof. The floor and walls are covered with marble. It is equipped with a corner bath with,an hydromassage shower and a washbasin stone cassis, including a tumble drye washing machine of 5 Kg. Booking the apartment is carried out by sharing a lease accompanied by a detailed inventory of equipment of the apartment, emailed on request when booking. Payment terms are 25% deposit upon booking. The balance on the day of handing over the keys Payments are accepted by check, cash, European or international IBAN transfers. The deposit of 250 Euros is paid on the day of handing over the keys and refunded after inventory on the day of departure. It is the owners who welcome you on your day of arrival for the keys, the opportunity to exchange valuable information for the smooth running of your holiday. The accommodation is available on the day of arrival from 17:00 and must be vacated on departure day to 9:00. We live in a house located 5 minutes from the apartment. The final cleaning room is available for an € 40. The option to arrange comfortable beds made on arrival for € 10. If you bring a laptop, you have a wifi internet permanent high speed connection. We stayed in the apartment for two nights in October. We really enjoyed using the ocean view terrace as the weather was beautiful while we were there. The apartment worked well for my husband, young daughter and I. While the kitchen is small, it is fully equipped with everything you could need. Checking in and working with Denis was very easy. While we had a car, we only used it to drive to Cap Canaille (a must visit! ), we walked everywhere else. There are two small beaches very near the apartment, and the town beach is a short walk away. The apartment is a very good value for the money. I hope to return someday! This was our THIRD visit to this lovely apartment, which surely is testimony to how good it is! Exceptionally well -equipped, beautifully located and very, very relaxing. I've said it all before in previous reviews but honestly it is a real home from home with everything you would want and a friendly, helpful owner ready to offer you tips and advice on what to visit if you can tear yourself away from the balcony or the beach. Thank you M. Reviron - we will be back next year!. 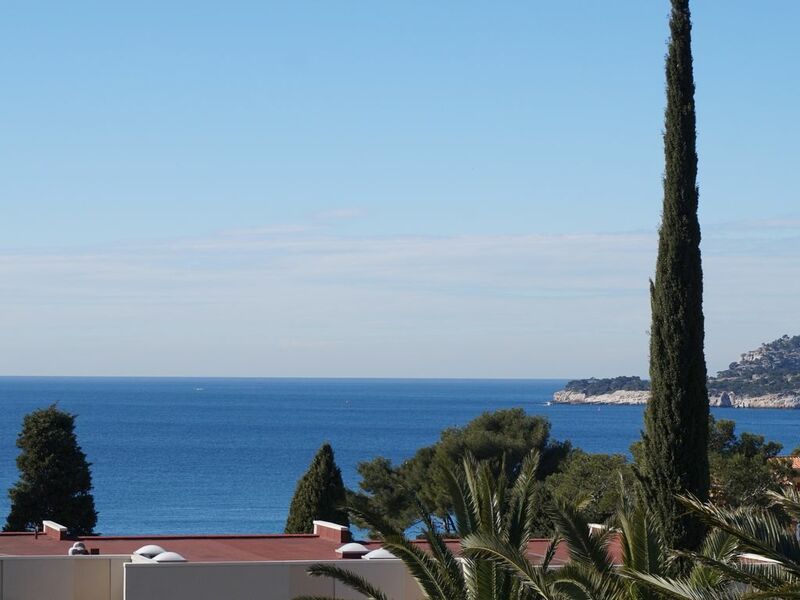 This is a beautiful apartment in a perfect, quiet location in Cassis. It has every amenity that you could possibly need. The kitchen is completely equipped with everything required to make a meal. There are 2 TVs, one in the living room and one in the bedroom. It has a combined washer/dryer in the bathroom. The internet connection was excellent. Internet is important to us when we travel, and the internet in this apartment was the fastest that we had during our entire stay in France. The balcony is a great feature of the apartment, very large and with a gorgeous view. I recommend this apartment without any reservations. We had a wonderful stay here. We visited this apartment last September and were determined to return. Less than nine months later there we were again and I have to say found it just as perfect as the first time, if not even better. M. Reviron seems to be always on the lookout for improvements and this time round we had the luxury of a brand new bed - firm but exceptionally comfortable. He has also installed a second TV in the bedroom and now provides beach towels which means you don't have to carry your own in your luggage. He is a very warm and friendly host and nothing is too much trouble. The flat is immaculate and peaceful - in fact the whole complex is a beautiful oasis away from the little town. We met some of the neighbours when there was a slight problem with the water supply and they were all lovely and discreet. I'd live there if I could, but that's not possible so we shall just have to keep going back. Next May is already pencilled in in our diaries for a return trip! A superb apartment with a magnificent view over the sea and cliffs.The rooms are light and airy and the balcony is so big it is almost like another room in itself! The apartment is extremely well- equipped with everything you could want and more: dishwasher, microwave, washing machine, toaster, kettle, coffee maker etc and even a mixer should you feel inspired to cook. All kinds of essentials are also provided e.g.towels, washing up liquid, soap and even loo paper. The apartment is in a very quiet location so we slept well. Cassis is a beautiful small town and the apartment is perfectly situated. It is about 10 -15 minutes walk into town (very slightly uphill comeing back) and only 10 minutes to the nearest beach. It is easy to go on walks from the door e.g les Calanques can be reached on foot in half an hour and the Route des Cretes begins almost immediately outside the front gate.A car is therefore not necessary. We walked everywhere and we are in our late sixtied. The owner is very helpful and quick to respond. He very kindly arranged our taxi back to the station for our return journey after we had had problems finding one when we arrived. All in all, a perfect holiday and we shall return! appartement lumineux et moderne, vue mer superbe, dans parc arboré et parking dans residence securisee. Merci d’avoir pris le temps de rédiger cette appréciation. Nous sommes heureux que vous ayez apprécié, les équipements de l’appartement, la vue, le parking et le parc de la résidence. Cassis, a small Provencal fishing port nestled between 2 natural sites: the famous Calanques massif 12 (8000 hectares protected) and the majestic Cap Canaille. This renowned tourist resort seduces with its quays lined with cafes and restaurants where visitors like strolling. The town has lovely old quarters with elegant seventeenth City Hall which opens on a shady square where Cassidens (inhabitants of cassis) like to come and enjoy the cool summer evenings. The ridge road that connects La Ciotat to Cassis overlooking the sea and offers an exceptional view. Golf: At 20 km of cassis, the Golf Dolce Fregate, Saint Cyr sur Mer, welcomes you to the heart of vineyards and olive trees in Provence with a panoramic view over the Mediterranean Sea, the resort at the foot of Dolce Fregate Provence. Designed by the famous American architect Ronald Fream in 1992, this golf course is part of the Dolce Hotels and Resorts chain, globally represented. Two golf courses are available: Frégate Par 72, 6,210 yards, 18 holes and Frégalon, Par 29, 1700 yards, 9 holes. Every Wednesday and Friday, the Provençal market. gastronomy, crafts, decorations, gifts and regional products, events, exhibitions, street performances, shows for children. MENAGE : Le ménage de fin de séjour peut être assuré moyennant 40 €. WIFI : Si vous apportez un ordinateur portable, Smartphone ou tablette, vous disposez d'une connexion internet wifi haut débit permanente qui est comprise dans le prix de la location. DRAPS ET LINGE FOURNIS : Sont mis à disposition draps housse, couette et housse de couette, oreillers et taies d’oreillers, pour le lit, le canapé-lit et le lit bébé. A votre arrivée, les lits sont faits. Sont également fournies : les serviettes de salle de bain, les serviettes de piscine ou de plage et le linge de cuisine, Ces mises à disposition sont comprises dans le prix de la location. Sont mis à disposition : l’ensemble des produits d’entretien pour le lave vaisselle et le lave linge, sacs poubelles, mouchoirs, papier essuie tout, savon liquide. Cette mise à disposition est comprise dans le prix de la location. CONSOMMATIONS ET TAXES : La consommation d’électricité, d’eau et de WIFI est comprise dans le tarif de location, ainsi que les taxes de séjour. ARRIVEE ET DEPART : C’est le propriétaire qui vous accueille à votre arrivée pour la remise des clefs, l'occasion d'échanger des informations précieuses pour le bon déroulement de vos vacances. Le logement est disponible le jour de l'arrivée à partir de 16 heures et doit être libéré le jour de départ pour 9 heures. La caution de 250 € est restituable après inventaire le jour de la sortie. L'appartement est non fumeur.